Our chickens’ pens, inspired by Polyface Farm, are moved every single day to give them fresh grass, fresh ground to scratch and somewhere new to poo. They have automatic drinkers (fed from a diesel fuel can – but it does contain water! The black plastic just excludes the light to stop it going green) and a hanging pellet feeder, both of which come with them when it is move time. Our ladies and gents also enjoy spent brewers mash from the lovely people at The Dove Street Inn, along with comfrey and vegetable trimmings from the farm – they just love aged sweetcorn that is too tired to go in the veg boxes! Many thanks to the many CSA members who have helped to build the pens, including Steve, Tom, Sue and Mark, not to mention friends of the farm Dave & Peter. 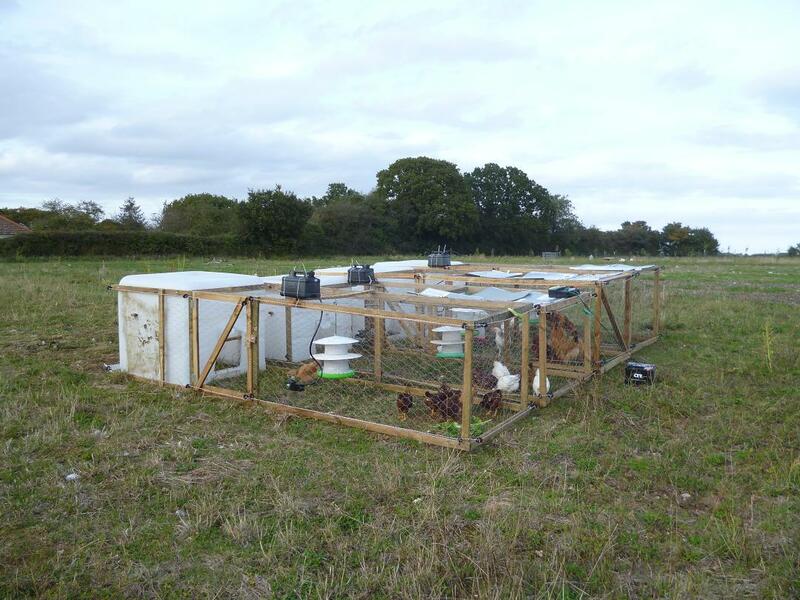 This entry was posted in chickens, general news, local food, low carbon, permaculture and tagged chicken pens, polyface farm. Bookmark the permalink.